We attended the Christmas Technology Press Event put on by the major UK retailer John Lewis today, and amongst the feast of insider tech information on offer was the snippet that Apple is “likely” to be selling an updated iPod Touch packing some of the features seen in the new iPhone 4. The spokesman for John Lewis said that the new iPod is likely to be sold as a multimedia device “targeted at youth/kids” and would come with an improved 5MP camera (withLED flash) for shooting/uploading HD video. 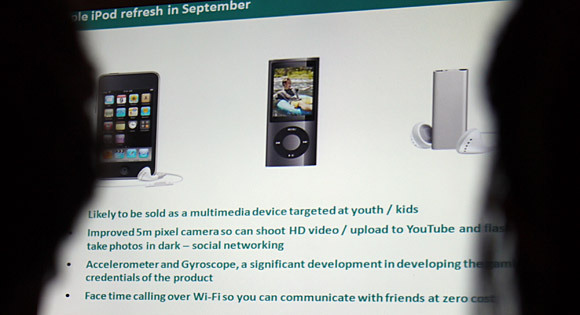 Here’s a slide from the presentation (complete with two heads obscuring the view on the side), clearly showing the date for a September iPod refresh. It seems that there’ll also be a front facing webcam for FaceTime video calls over Wi-Fi, and Apple are showing their commitment to developing the device as a gaming platform with the inclusion of a gyroscope and accelerometer. We’re not sure what John Lewis were basing this information on, but as Europe’s biggest electrical retailer (measured by sales per square foot of shop space), if anyone’s going to know, it’ll be this lot. Well they got most of it wrong, speculation in their marketing dept. The camera is nothing like 5 Mps ?